Songs of Willow Frost by Jamie Ford is set in Seattle in 1934 as a twelve-year-old boy sees a woman on a movie screen he believes to be his mother who abandoned him five years prior. With the help of a friend, a blind girl living in the same the orphanage, he sets out to find and reconnect with his mother. The story flips back and forth between William’s quest and his mother’s story in the 1920s, revealing why she would leave the son she loved behind. I liked this book. 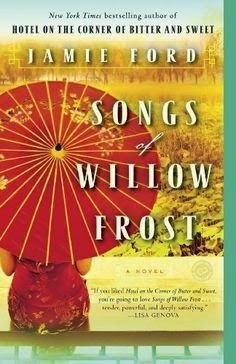 It held my interest with the heart-wrenching story of Willow Frost intertwined with the Great Depression, racial suppression, as well as Chinese tenets and superstitions. This was a book club selection and my fellow readers also liked the book. All around it held everyone's interest. We were outraged at the prejudices of the times and the hardships that women in particular had to endure. We were saddened at the orphanage system and incidents in the book. In the end, we all gave it a thumbs-up.